The one week countdown has begun leading up to the biggest shooting sports, hunting and law enforcement convention in the country. 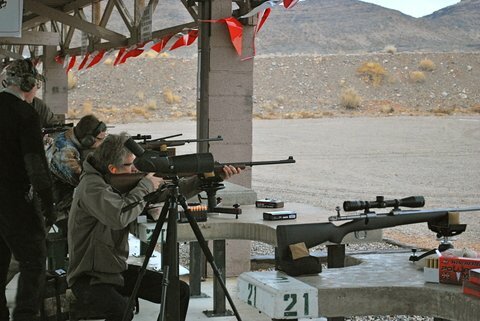 The 2016 SHOT Show, organized by the National Shooting Sports Foundation, will attract more than 60,000 industry professionals and 1,600 exhibitors to the Sands Expo Center in Las Vegas. Beginning Monday Jan 18, LiveOutdoors will bring you an inside look at the invite-only Industry Day at the Range. Get a first hand perspective on what it’s like to shoot some of the industry’s latest weapons. We’ll be there with continued coverage throughout the week on what’s new and exciting in cutting edge firearms, ammunition, optics, tactical gear, outdoor apparel and much more. This year’s trade show covers 630,000 square feet of exhibit space amounting to 12.5 miles of aisles. It draws professionals from all 50 states and 100 countries, and has been held in Las Vegas for the past 17 years. The trade show is exclusive to industry and media participants, so average consumers are not allowed inside. That’s where we come in. Check back to our SHOT Show hub throughout the week for detailed updated with new product galleries, new product information and celebrity appearances. You can also follow the action at SHOTshow.org.